Because Skopelos is off the beaten path, it has remained relatively unspoiled. 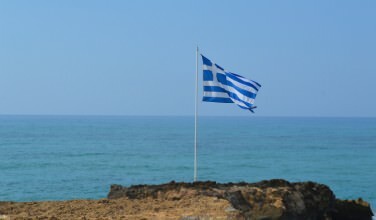 This means that those who do visit have access to everything they expect from a Greek island without all the crowds. It’s perfect for those who love to create a vacation on their terms and not let the crowds dictate what they do. Viewing natural scenery that has been untouched for centuries is one of the charms of this island. If your main draw is the scenery, be sure to check out the Sporades National Marine Park, which not only has great scenery, but also many fine examples of Aegean marine life. The main town on the island, Skopelos Town is just as charming as the rest of the island. The town itself hugs a few steep hills, and the winding roads that work their way through the inclines only adds to the charm. 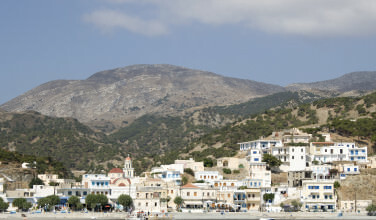 While here, visitors can take in the sights, such as the Agios Michali, one of the island’s oldest churches. 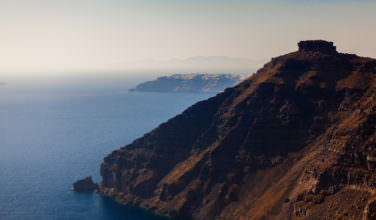 You can also find all the typical things that make the Greek islands so great – beaches, nightlife, and plenty of restaurants and tavernas to give you a glimpse of the local character. While here, be sure to hit one of the traditional tavernas late at night to enjoy the traditional, soulful rebetiko music. Though the island is small, it does have some pretty beaches that are worth a visit. 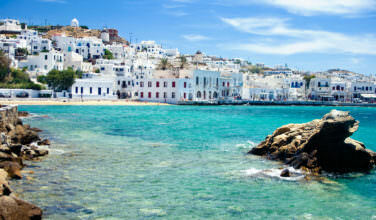 These beaches have all the character of a typical Greek beach, but without the volumes of people. 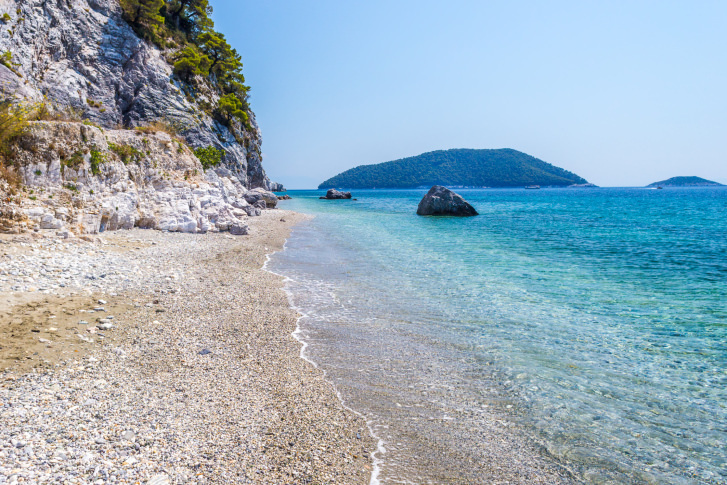 This means that if you want to travel to Skopelos during peak season, you’ll find that the beaches have a steady flow of visitors without being oppressive. Some of the best beaches include Panormos, Stafilos, and Kastani, all of which are easily accessible from Skopelos Town. If you actually want to experience a busy tourist bustle, Loutraki Beach, which is further away from Skopelos Town than the other beaches, is one of the most popular beaches on the island. One thing that Greece is known for is its delicious and healthy cuisine. On Skopelos, you’ll be treated to all the same favorites that you can find all over Greece with the addition of some local favorites. Make sure you eat some Greek lobster before leaving the island! One popular dish, Astakos Giouvetsi, is a lobster dish served with orzo pasta and is definitely worth seeking out. Other seafood favorites include grouper fish and sea urchins, which are considered a delicacy. If you love sweets, don’t miss the amygdolata, which is an almond cookie made with marzipan.